Days after his family emigrated from Seoul in 1980, 12-year-old Duk-ki Yu picked up a pair of Adidas Country runners—his first name-brand sneakers. He’d only seen select athletes wearing Adidas in Korea—the start of the pervasive culture shock Duk-ki would experience in California. San Francisco offered the nearest access to urban culture. By college, Duk-ki was making monthly sneaker-hunting trips to the city, DJ’ing after school, and planning his escape to the East Coast. 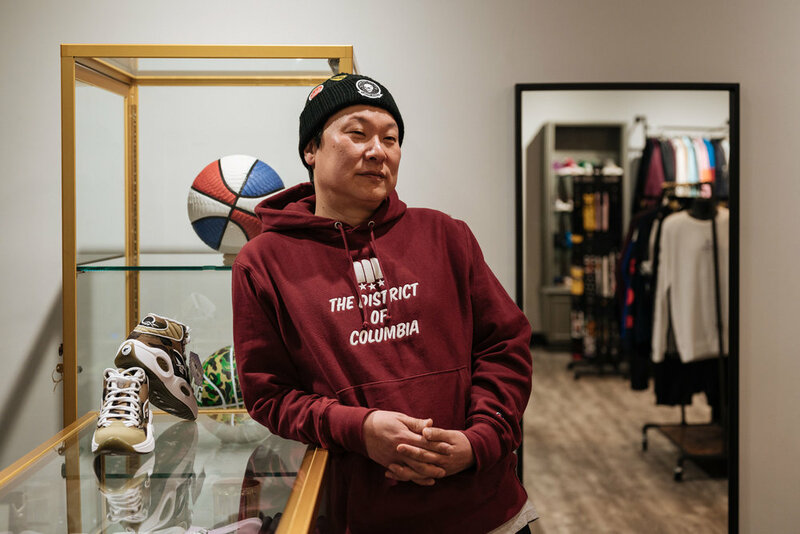 After graduation, he moved to DC and enrolled in Georgetown’s business school—unknowingly paving the start of an unexpected path that would culminate in his own sneaker store 25 years later. At the time, he simply loved the rich culture around him. While still in school, Duk-ki threw himself in the entertainment world. He made weekly trips to New York City and began networking at record companies. Eventually, he was hired to promote the records in DC. Duk-ki honed his presentation skills, walking rap records into R&B stations and convincing production assistants to play them if he cut out all the swearing. Hip hop began influencing mainstream culture, and by the mid-90s, Duk-ki was hanging out with the likes of Russell Simmons, meeting influencers, and talking all things fashion and sneakers. As street wear became more established, Duk-ki invited designers to follow him and his musician friends on the road, giving out their promo gear to college athletes through grassroots marketing. Along the way, Duk-ki’s rare sneaker collection grew. Eventually, Duk-ki pivoted to start his own advertising and marketing agency, promoting cars, soft drinks, and liquor. There, he was approached by Reebok. BET was still headquartered in DC, and Duk-ki called on his connections there to set up a makeshift office in their greenroom. When an artist was in town to perform on the network, Duk-ki would go down that afternoon and outfit every background dancer and entourage member. The following year, Duk-ki and a friend from Nike went on a hip hop station in San Francisco to talk about sneakers. The experience was surreal. And yet, it would be another decade before Duk-ki opened his own store on Wisconsin Avenue. In the years between, he consulted for Internet start-ups and ran a marketing campaign for Electronic Arts—procuring artists and promo deals, and working with radio stations on various launches. All of his worlds were finally integrated—culminating in 2002 when Duk-ki designed a shoe with Nike for a video game release. Nike gave him hundreds of pairs to seed—hand-delivering them to Puffy, Damon Dash and Swiss Beatz, among others. The campaign blew up—and gave Duk-ki an idea. There were shops in New York that had evolved to full-fledged sneaker boutiques, but there was nothing like it in DC. Kids were always asking Duk-ki about his shoes, and he knew he finally had to capitalize. With a wife, two young children, and his own agency, Duk-ki planned to hire a few young guys to run a new sneaker and street wear store called MAJOR. He would simply provide the business acumen and relationships. But by that time his partners got cold feet, Duk-ki had already signed both a lease and contract with Nike, and commissioned a logo design. He had no choice but to leave the agency work behind, and devote himself to MAJOR. Duk-ki relied on years of relationship-building, from surf and skate brands in California to hip hop brands in New York City, and knew he could curate his collection better than anyone else. Today, MAJOR welcomes new product daily, but Duk-ki remains the constant on the floor—connecting with an increasingly younger and more fashionable demographic to introduce them to the right sneakers. Duk-ki understands the transformative power of his business, and a single pair of sneakers. At best guess, he owns thousands—stored in an apartment and a warehouse—but still remembers when Air Jordans hit the shelves in 1985. Much of Duk-ki’s collection serves as both a time capsule and an inspiration board for new, exclusive collaborations, including the Washington Capitals shoes he designed with Reebok during the 2017 playoffs. The sneakers were released as the Caps were on the brink of elimination against the Penguins, symbolizing a rallying cry for 400 fans who lined up outside of the store to get a pair. They meant more than rubber and laces. They always do.